In a rare public disclosure revealing the financial relationship between a big agency holding company’s media operations and a digital media supplier, WPP’s GroupM is listed as the single biggest creditor in Videology’s bankruptcy filing. Three of GroupM’s offices -- including GroupM UK, Finecast Limited, and GroupM Worldwide -- are listed as the first, second and fourth-biggest creditors, respectively, with claims totaling more than $35 million due the agency from Videology, a supplier of programmatic video advertising. The filing does not detail why GroupM is owed money from Videology, but observers who are knowledgable about the relationship say at least so o me of it is attributable to rebates paid to GroupM for buying media through Videology on behalf of its clients. GroupM is also listed in the filing as one of Videology’s significant shareholders, but it’s unclear whether GroupM made a capital investment in the digital startup or whether it received the equity as another form of compensation for buying media through Videology. 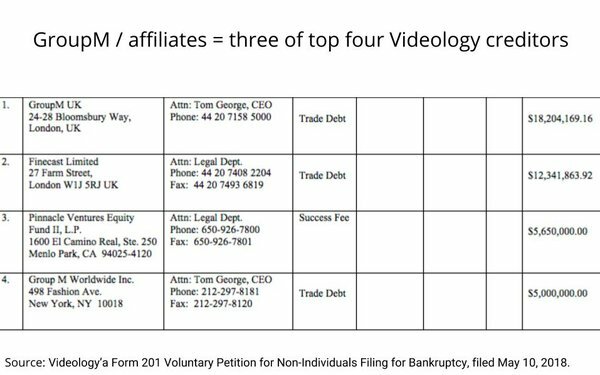 While none of these practices are unusual in modern day agency/supplier/client relationships, the Videology bankruptcy filing reveals some of its magnitude. That said, it’s unclear what period or volume of business GroupM’s claim represents. “Why is a seller of media paying so much money to a media buyer? How much have they been paying over the past 10 years?,” asked one observer after reviewing the filing. 2 comments about "GroupM Revealed To Be Videology's Largest Creditor, Owed $35 Million-Plus". Ed Papazian from Media Dynamics Inc, May 14, 2018 at 10:38 a.m. Very interesting as this is the first time I have seen anything that puts a possible value on the "rebates" that might have been going to agencies active in digital media buying. Not definitive proof of bad conduct----but certainly worth noting. Chris Peterson from R2C Group, May 19, 2018 at 12:31 p.m.
"Rebate" puts it very mildly. I'd love to see GroupM disclose the financial backup for Videology actually buying media from them, but I'm not holding my breath. This looks really really bad without definitive proof. That last sentence is also a head scratcher - "Our relationship with Videology and its benefits are disclosed to our clients." Since when are "benefits" "disclosed?" Clearly this is crafted by a nervous attorney. It's shameful how some of the large networks destroy trust within the industry for everyone else.